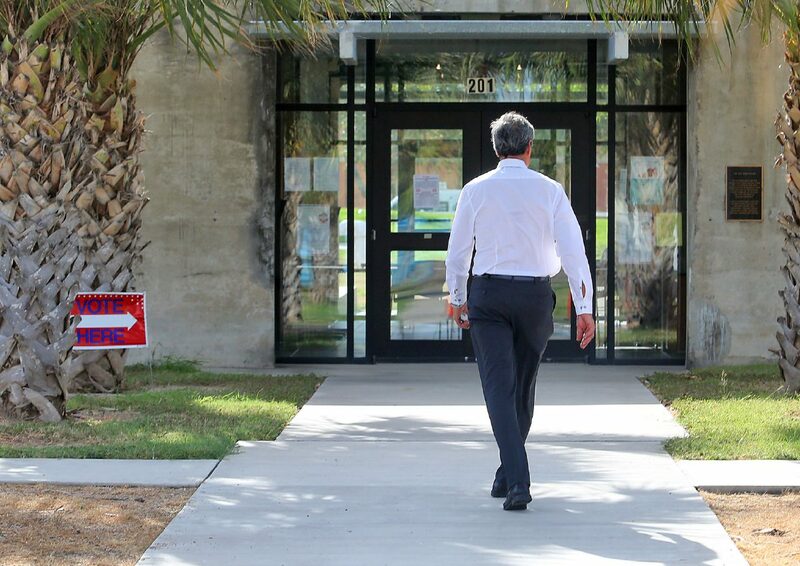 A man walks into a early polling place at the Old Pump House in Fireman's Park on Tuesday, Aug. 28, 2018, in McAllen. McALLEN — Voters here will decide a school district tax ratification election Saturday, which, if approved, will generate nearly $8 million per year. Early voting for the proposed ratification election, or TRE, ended Tuesday with 675 ballots cast — the largest turnout during the 11-day period. There were a total of 1,599 ballots cast during early voting, 280 of which were by mail. The first day, Aug. 22, and Saturday, Sept. 1, raked in the second- and third-highest early voting turnouts. Polls will open from 7 a.m. to 7 p.m. on Election Day today at the Gonzalez Elementary School, Lark Community Center, Lincoln Middle School, Palmview Community Center, McAllen High School and Fields Elementary School. McAllen ISD officials proposed the TRE to levy more of its current tax rate — $1.155 per $100 valuation — for maintenance and operations. Currently, $1.04 of the total tax rate can be applied to pay the school district’s maintenance and operation costs, also referred to as the M&O fund. The remainder is allocated for paying off debt, referred to as the interest and sinking, or I&S fund. If the TRE is approved, 11.5 pennies will be moved from the I&S to the M&O fund, which is matched at a higher rate, to generate more state dollars. This move would not incur change on the taxpayer as the tax rate will remain the same, according to Assistant Superintendent for Business Operations Lorena Garcia. “You are still collecting taxes on the same amount of money. … The difference is that if you leave it in the I&S side, the state-matching dollars will only levy about $400,000 versus the M&O side, in which the state will match you almost dollar-per-dollar. That will get you another $7 million,” Garcia said in May. McAllen ISD has estimated $7.8 million generated annually by the “penny swap” — funds intended to afford security upgrades for the police department and district-wide facilities; hiring police officers for each elementary campus; new science labs at the McAllen High, Nikki Rowe and Lamar Academy; intercom upgrades at four campuses; and the installation of 134 defibrillators at district facilities as well as increasing staff compensation.